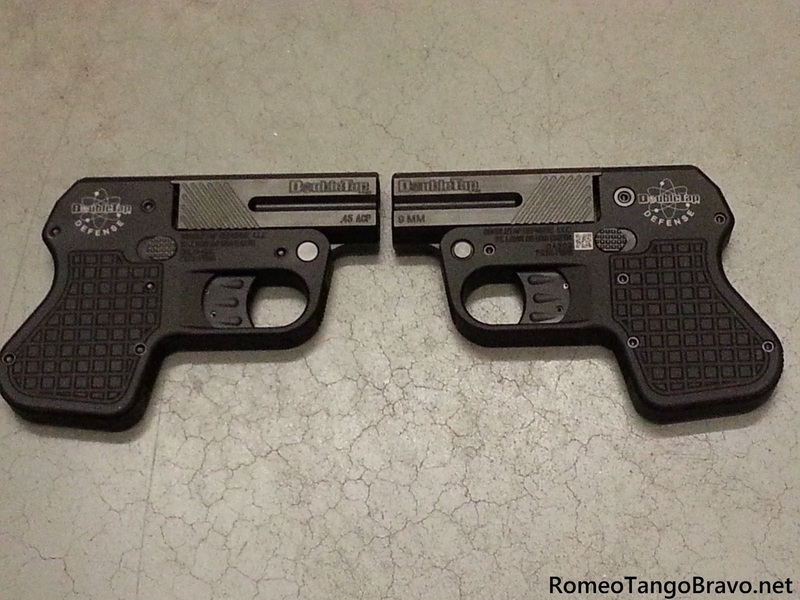 RomeoTangoBravo: DoubleTap Tactical Pocket Pistol Hits the Shelves! Many have been waiting for this derringer-type pistol for well over a year. 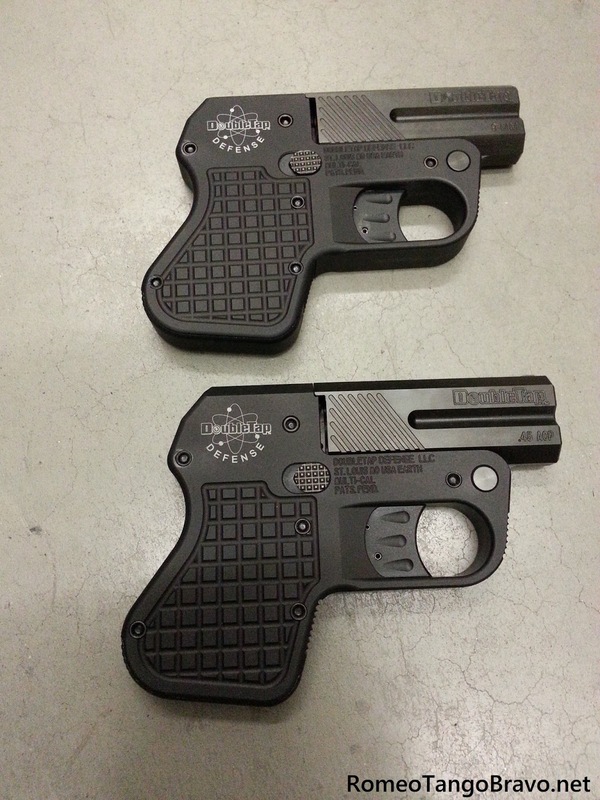 There were some initial delays in production but were remedied once DoubleTap Defense found a new manufacturer. 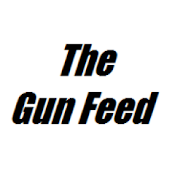 The details of the situation have no real importance at this point but Heizer Defense was unable to fulfill its obligations and Azimuth Technologies was chosen as the current manufacturer. If you would like to read more into the situation I'll direct you here and here. 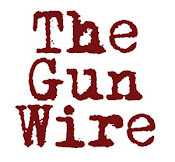 You can also check out some of the coverage from the 2013 SHOT Show. 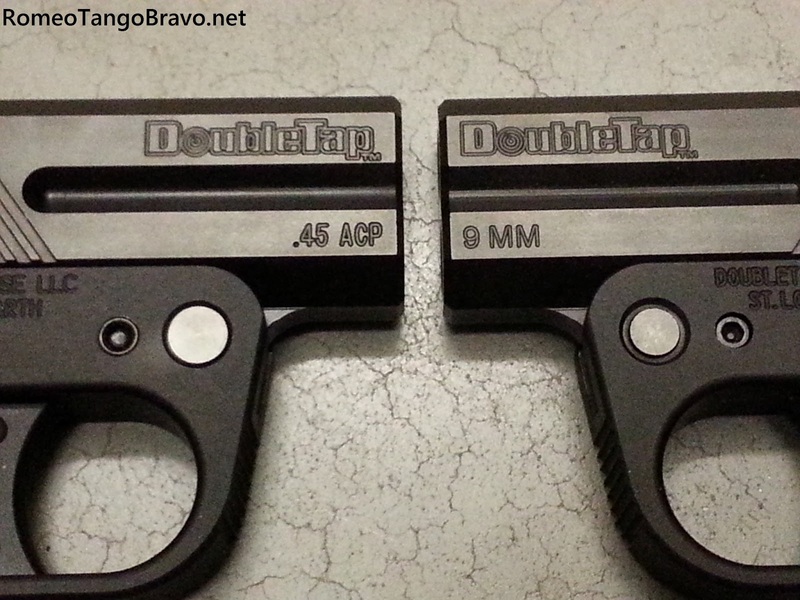 The DoubleTap models that I was able to handle were the aluminum non-ported 9mm and 45ACP. The pistols were a bit larger and heavier than I would have expected and were noticeable in the pocket. Compared to two popular pocket pistols; the DoubleTap is a bit heavier at 12oz. 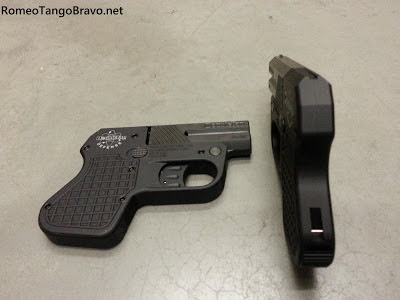 The Ruger LCP is 9.4oz. and the Smith and Wesson Bodyguard is 11.85oz. 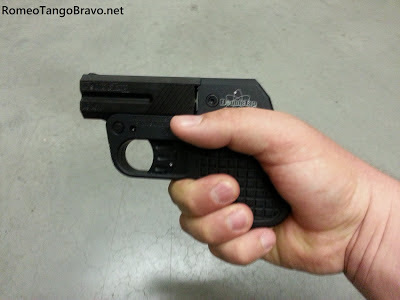 (all empty weights) The pistol is comfortable to hold even while being very slim (.665") and the 'frag' grip texture seems to give a reliable amount of traction. The trigger is a bit of a letdown. It is long, stagey and stacky; one person described the trigger as different from pull to pull and I can't disagree with that description. 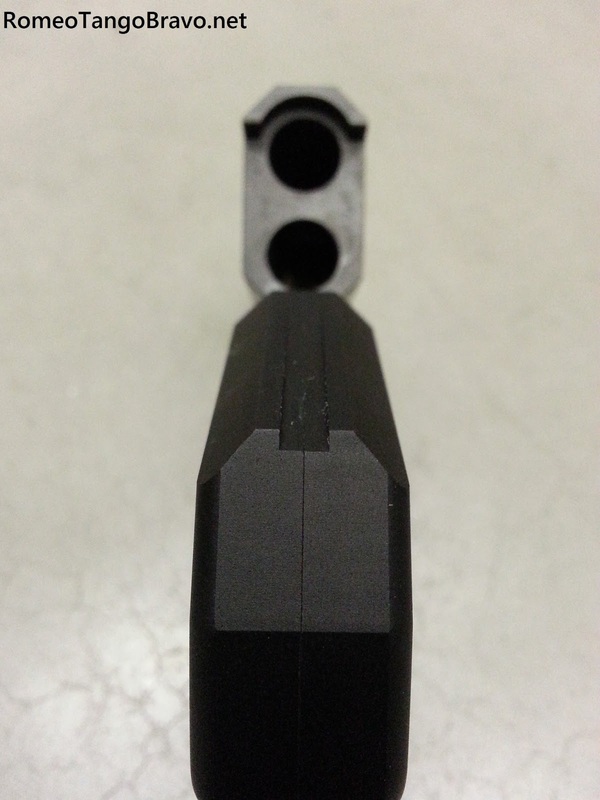 The barrel release is ambidextrous and simple to use. It's large enough that you don't have to search for it and has enough texture to operate it easily. 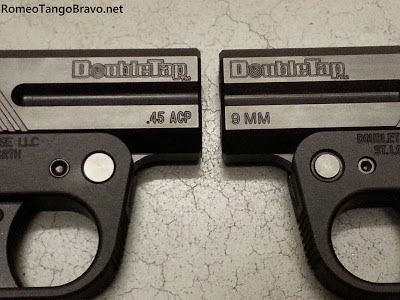 A highly advertised feature of the DoubleTap is the 'trapdoor' in the grip. Inside there is just enough room to hold a SpeedStrip (that is provided with the pistol) with two more rounds which provide you with a reload. 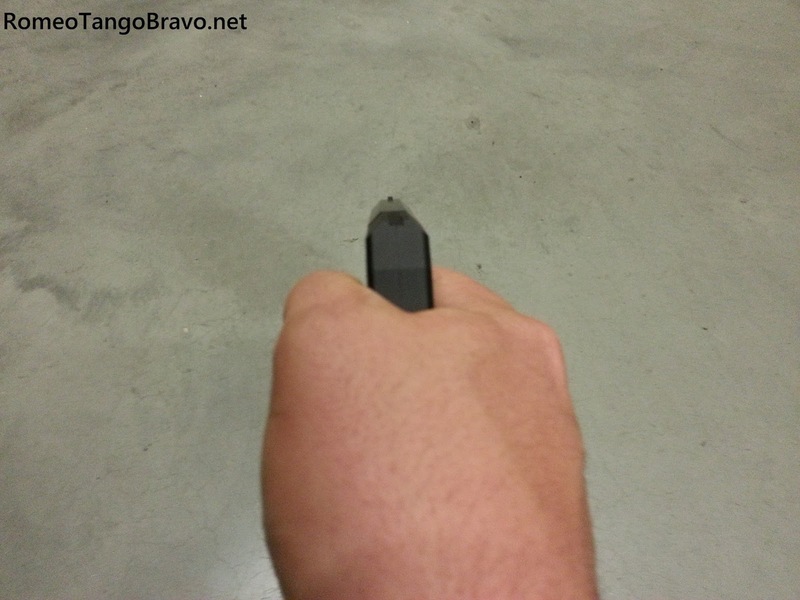 During the time I was handling the pistol the screw that holds the detent that secures the 'trapdoor' backed out just enough to render it inoperable. The door just swung there not being able to be closed. This was easily remedied with the proper application of a screwdriver to secure the detent. The overall appearance of the pistol is fantastic. There is seam that runs around the frame that splits the pistol into two halves; this may bother some folks but is well fitted. The fragmentation grenade inspired grip texture is eye-catching and effective. 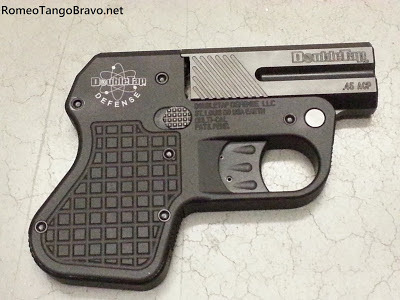 I cannot comment of the finish of the pistol but can imagine that wear will be apparent if used as an everyday carry. I know wear concerns some people; but it shouldn't when wear is expected. The elephant in the room is that this is a two shot wonder. Whether you choose the 45ACP or the 9mm you only have two shots ready and many folks may/should be uncomfortable with that situation. The only way I could justify the pistol was if it was a back-up to a back-up; maybe. Any way you slice it this is a niche pistol that you'll either give the slightest glance and shrug or you'll hunt one down to add to your collection. Overall, shots were fired by the defender in 72% of incidents. The average and median number of shots fired was 2. I would hate to bet my life on averages. I'd prefer to have as much as an advantage as possible. Really? So you waddle around in public with a full-size 1911 & 4 extra mags on your belt? Or is there a compromise in there somewhere? So for $600+, you get a 2 shot crappy trigger gun with no sights. 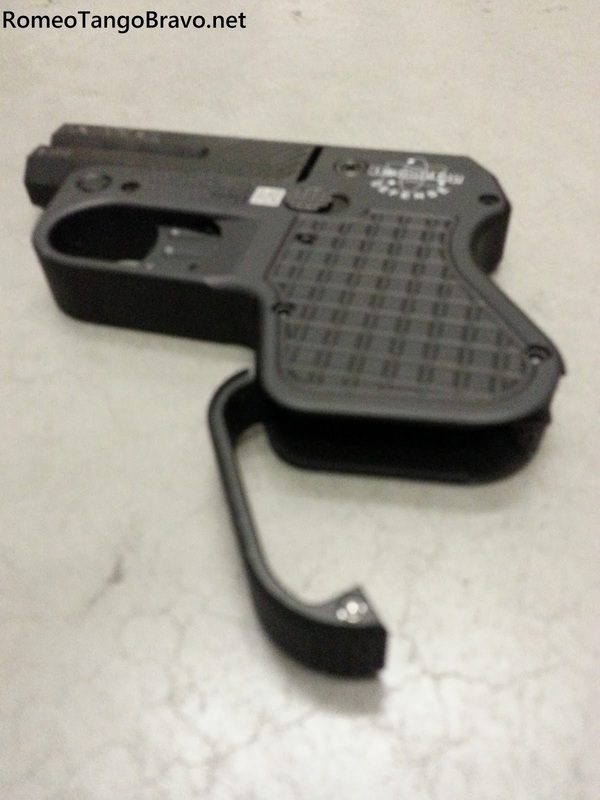 Why not buy a Ruger lc9 for ~$400 which has good sights, a fair trigger and 7+1 rds of 9mm for only 4 more ozs ? It's NOT a crappy trigger, grasshopper. It's a pocket pistol with no external safety. That means the only thing between you and a negligent discharge is the trigger. A nice, long, heavy trigger pull. And that's exactly what it is. No sights? 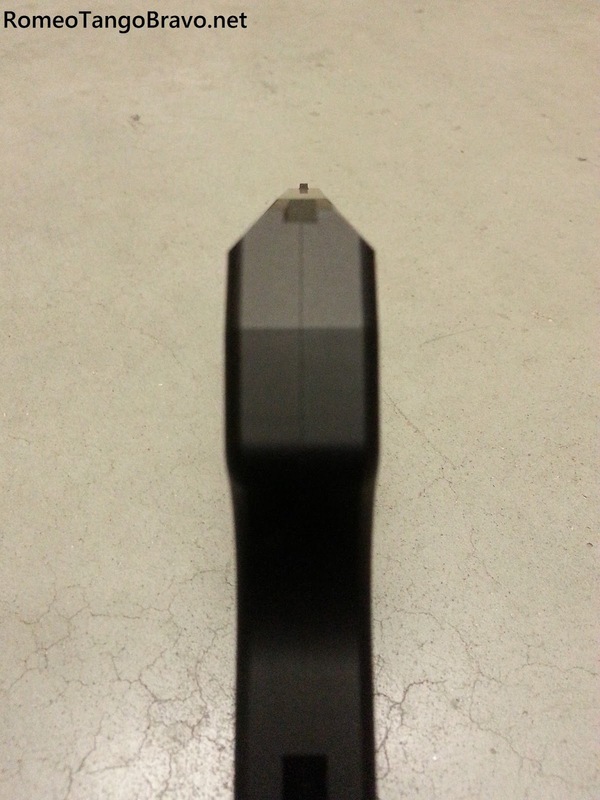 What are the sights for on your LC9.? Pretty useful, are they? I didn't think so. 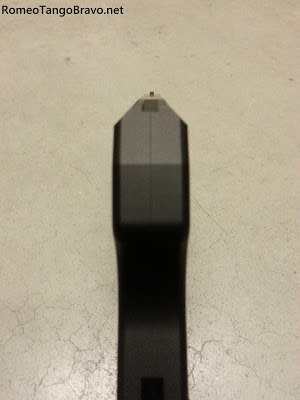 Not to mention, your LC9 in a close fight has a very good chance of being pushed out of battery, rendering it useless. I'll take 2 ruonds of .45 ACP any day. Pistols are a perfect blend of balance, raw strength, and discipline. With that said, they must be earned.